Today the people living in rich countries around the North Atlantic, who represent 11 percent of the world population, make up 60 percent of the Level 4* consumer market. Already by 2027, if incomes keep growing worldwide as they are doing now, then that figure will have shrunk to 50 percent. By 2040, 60 percent of Level 4 consumers will live outside the West. The truth of the very widespread increase in wealth around the globe has influenced my investing strategy for decades. It should be influencing yours, is it? It is not doctors and hospital beds that save children’s lives in countries on Level 1 and 2*. Beds and doctors are easy to count and politicians love to inaugurate buildings. But almost all the increased child survival is achieved through preventative measures outside hospitals by local nurses, midwives, and well-educated parents. Especially mothers, the data shows that half the increase in child survival in the world happens because the mothers can read and write. Data is extremely valuable in helping us make decisions and evaluating the effectiveness of policy. However it is critical to be careful. It is very easy to focus on meeting targets that seem sensible – increasing the number of hospital beds – but that lead to less effective policy. 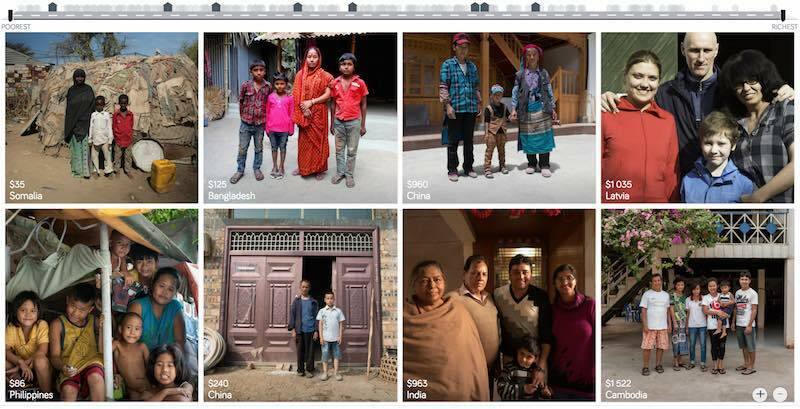 Dollar street provides photos of people at all 4 income levels from around the globe. This illustrates Hans’ point that what determines how people live and what their circumstances look like is mostly a matter of income not the country they live in. It is simple idea but one that runs counter to much of the economic discussion focused so much on national boundaries. National boundaries do matter and the laws and economic reality of the national economy has a large impact but the issues for people at each level of income are much more tied to those in their level of income anywhere in the world than they are tied to their nation. The book relentlessly points out the great progress that has been made globally over the last 50 years and how that progress continues today and looks to be set to continue in the future. We have plenty of areas to work on improving but we should be aware of how much progress we have been making. As he points out frequently he has continually seen huge underestimation of the economic conditions in the world today. 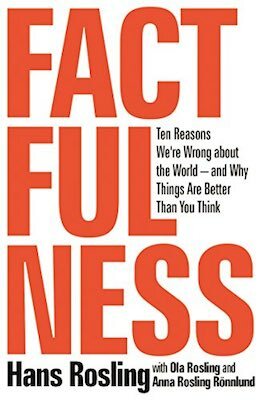 This book does a great job of presenting the real success we have achieved and the progress we can look forward to in the future. Level 1 has 0.75 billion people living on less than $2 per day. Level 2 has 3.3 billion people living on incomes between $2 to $8 per day. Level 3 has 2.5 billion people living on $8 to $32 per day. Level 4 has 0.9 billion people living on more than $32 per day. Even if some lobbyists and their friends in Washington DC try to distract from the long term failure of the USA health care system the data continues to pour in about how bad it is. America was 50th out of 55 countries in 2014, according to a Bloomberg index that assesses life expectancy, health-care spending per capita and relative spending as a share of gross domestic product. Expenditures averaged $9,403 per person, about 17.1 percent of GDP, that year — the most recent for which data are available — and life expectancy was 78.9. Only Jordan, Colombia, Azerbaijan, Brazil and Russia ranked lower. None of these rankings are perfect and neither is this one. But it is clear beyond any doubt that the USA healthcare system is extremely costly for no better health results than other rich countries (and even more expensive with again no better results than most poor countries). It is a huge drain on the economy that we continue to allow lobbyists and special interests to take advantage of the rest of us via the Democrats and Republican parties actions over the last few decades. We have to improve. The costs imposed on everyone to support those benefiting from this decades old transfer of economic wealth to health care special interests should no longer be accepted. The top 5 countries are: Hong Kong, Singapore, Spain, South Korea and Japan. The first four have costs about 25% of the USA. Japan costs about 40% of the USA per person cost. Mylan’s despicable actions with Epi-pen and the direct participation of both political parties in increasing the costs foisted on the health care system by Mylan is just one in hundreds of the individual actions that continue to saddle the rest of USA economy with huge costs. The International Federation of Health Plans has published the 2015 Comparative Price Report, Variation in Medical and Hospital Prices by Country. Once again this illustrates the excessive cost of health care in the USA. See related posts for some of our previous posts on this topic. The damage to the USA economy due to inflated health care costs is huge. A significant portion of the excessive costs are due to policies the government enacts (which only make sense if you believe the cash given to politicians by those seeking to retain the excessive costs structure in the USA the last few decades buy the votes of the political parties and the individual politicians). In 2015, Humira (a drug from Abbvie to treat rheumatoid arthritis that is either the highest grossing drug in the world, or close to it) costs $2,669 on average in the USA; $822 in Switzerland; $1,362 in the United Kingdom. This is the cost of a 28 day supply. All the prices shown here are for the prices reported are the average allowed costs, which include both member cost sharing and health plan payment. So it only includes costs for those covered by health plans (it doesn’t include even much larger price tags given those without insurance in the USA). Harvoni (a drug from Gilead to treat hepatitis C is also near the top of drugs with the largest revenue worldwide). This is also a drug that has been used as a lightning rod for the whole area of overpriced drugs. One interesting thing is this is actually one that is not nearly as inflated in the USA over other countries nearly as much as most are. Again, for a 28 day supply the costs are $16,861 in Switzerland; $22,554 in the United Kingdom and $32,114 in the USA. Obviously quite a lot but “only” double the cost in the USA instead of over triple for Humira (from Switzerland to the USA). Tecfidera is prescribed to treat relapsing multiple sclerosis. The cost for a 30 day supply vary from $663 in the United Kingdom to $5,089 in the USA ($1,855 Switzerland). There are actually some drugs that are more expensive outside the USA (though it is rare). OxyContin is prescribed to treat severe ongoing pain and is also abused a great deal. The prices vary from $95 in Switzerland to $590 in the United Kingdom ($265 in United States). The report also includes the cost of medical procedures. For both the drugs and the procedures they include not only average but measures to show how variable the pricing is. As you would expect (if you pay attention to the massive pricing variation in the USA system) the variation in the cost of medical procedures is wide. For an appendectomy in the USA the 25th percentile of cost was $9,322 and for the 95th was $33,250; the average USA cost was $15,930. The average cost in Switzerland was $6,040 and in the United Kingdom was $8,009. As has been obvious for decades the USA needs to stop allowing those benefiting from the massively large excessive health care costs in the USA from buying the Democrats and Republicans support to keep prices so high. But there has been very little good movement on this front in decades. Now if you think you understand english you might think this is the maximum you have to pay out of your pocket. If you understand how horrible the USA health care system is and how nothing is easy, you probably suspect it isn’t a maximum at all. I find myself thinking that I don’t really understand what this seemingly simple value actually means, so I decided to research it and write this blog post. First of all you have to pay the monthly premiums (assuming your employer doesn’t pay them for you), probably a few hundred or more dollars every month. Then the coverage likely has a deductible maximum for the year. For this example, for 1 person the insurance costs $300/month with a yearly deductible maximum of $5,000. And the insurance plan says there is an out-of-pocket “maximum” of $6,500. Well 12 *$300 + $5,000 = $8,600. So, as you can probably guess, out-of-pocket “maximum” doesn’t actually mean the maximum out of your pocket. In fact the $8,600 is excluded from the out-of-pocket maximum calculation altogether. So, you then might think ok, my actual out-of-pocket maximum (the most I will have to pay all year for health care) is $8,600 + $6,500 = $15,100. But that isn’t right either. First, this is only for covered medical expenses, uncovered medical expenses are not included. This makes some sense, certainly, but in your planning, you can’t think your health care costs are capped at $15,100. Especially since in the USA lots of health care will be uncovered (dental care is often excluded, mental health care may well be limited, certain types of treatment may not be covered, prescription glasses, non-prescription drugs, addiction treatment…). Remember, USA health care coverage isn’t even just limited by the type of care. For example, even if fixing your injured leg is covered, if you don’t do it using exactly the right places (where your health plan covers the cost), it may be considered to be uncovered care. In general, emergency care is more flexible for what is covered, but the horror stories of dealing with health insurers refusal to pay for provided health care adds risk to any health care someone gets in the USA. Here is a good explanation of out-of-pocket cost questions (in this quote looking at out of network costs): “Out of Pocket Maximum” and health insurance plan terminology and calculation? USA health care spending increased at a faster rate than inflation in 2013, yet again; increasing 3.5%. Total health expenditures reached $2.9 trillion, 17.4% of the nation’s Gross Domestic Product (GDP) or $9,255 per person. While this remains bad news the rate at which heath care is increasingly costing those in the USA has been slower the last 5 years than it has been in past years. Basically the system is getting worse at a slower rate than we used to be, so while that isn’t great, it beats getting worse as quickly as we used to be. For the last 5 years the rate of increase has been between 3.6% and 4.1%. GDP has increased more than inflation. As the GDP grows the economy has more production for society to split. The split between the extremely wealthy and the rest of society has become much more weighted to the extremely wealthy (they have taken most of the gains to the overall economy in the last 20 years). Health care has a similar track record of devouring the gains made by the economy. This has resulted in health care spending soaring over the decades in an absolute basis and as a percentage of GDP. The slow down in how badly the health care system has performed in the USA has resulted in the share of GDP taken by the health care system finally stabilizing. Health care spending has remained near 17.4% since 2009. While hardly great news, this is much better news than we have had in the last 30 years from the USA health care system. The percentage of GDP taken by the USA health care system is double what other rich countries spend with no better health results. It is similar to if a team started as a championship team and then got worse every year and now they have finally stopped getting even worse. Granted they have become the worst team in the league but if, say, their record has now been 5-55 for 3 years in a row, they at least are not winning fewer game in each subsequent year anymore. But you can hardly think you are doing a great job when you are clearly the worst team each and every year. Obviously there is a need for much much more improvement in the USA health care system. Still stopping the growth in spending, as a percent of GDP, is a positive step toward drastically decreasing it to reach a level more in live with all other rich countries. Even this goal is only to have the USA reach a level of mediocrity. If you actually believe the USA can to better than mediocre that would imply a combination of drastic declines in spending (close to 50%) and drastic gains in outcomes. Decreasing spending by 50% would put the USA at essentially the definition of mediocre – middling result with average spending. Hospital Care: Hospital spending increased 4.3% to $936.9 billion in 2013 compared to 5.7% growth in 2012. The lower growth in 2013 was influenced by growth in both prices and non-price factors (which include the use and intensity of services). Physician and Clinical Services: Spending on physician and clinical services increased 3.8% in 2013 to $586.7 billion, from 4.5% growth in 2012. Slower price growth in 2013 was the main cause of the slowdown, as prices grew less than 0.1%, due in part to the sequester and a zero-percent payment update. USA health care spending increased at a faster rate than inflation in 2012, yet again; increasing 3.7%. Total health expenditures reached $2.8 trillion, which translates to $8,915 per person or 17.2% of the nation’s Gross Domestic Product (GDP). The GDP is calculated was adjusted in 2013 and the data series going back in time was adjusted. These changes resulted in increasing historical GDP values and making the portion of GDP for health care to decline (for example in 2011 using the old calculation health care was 17.9% of GDP and now 2011 is shown as health care spending representing 17.3% of GDP). While health care spending increased faster than inflation yet again, the economy actually grew at a higher rate than health care spending grew. That the spending on health care actually declined as a percentage of GDP is good news; and it may even be that this hasn’t happened for decades (I am not sure but I think that might be the case). Hospital Care: Hospital spending increased 4.9% to $882 billion in 2012. Physician and Clinical Services: Spending on physician and clinical services increased 4.6% in 2012 to $565 billion. Other Professional Services: Spending for other professional services reached $76 billion in 2012, increasing 4.5%. Spending in this category includes establishments of independent health practitioners (except physicians and dentists) that primarily provide services such as physical therapy, optometry, podiatry, and chiropractic medicine. Medical “tourism” is a potentially huge market. The size of the market is greatly aided by the extremely expensive and broken USA health care system. Even while the standard rich country provides the same, or better, results than the USA for half the cost they are not doing well either (so the USA is very bad compared to pretty bad results for rich countries on average). Medical tourism is on of the most attractive economic growth areas. However the competition is fairly high as the attractiveness of building such an industry is well known. Countries that have very good potential are: Thailand, Mexico, Malaysia, Singapore (for high end solutions), Costa Rica, India, Philippines and Panama. India has some great advantages but they have a deeply ingrained and extremely unhelpful bureaucracy. It seems to me that that creates a burden that likely means India can’t complete with the others effectively. Even for the simplest aspect – visas for those seeking to bring income into the country as medical tourists I don’t have confidence India can do well. India continues to be held back economically (across the entire economy not just in health care) by ineffective and burdensome regulation and government inefficiency. The USA actually has a portion of the medical tourism market – those that have no concern about price (royalty, trust fund babies, movie stars etc.). Those with any concern about price can find the same level of care in Singapore, Japan, France, etc. at a fraction of the price. I believe 2 or 3 countries in South East Asia will do very well with international medical care. The extent to which Thailand, Philippines, Singapore and Malaysia (and potentially others) do in this field could greatly impact their economic success. There is a great potential for Singapore and Malaysia to cooperate in this area (in Malaysia’s Iskandar region, which borders Singapore). I think we could use some innovation in our model of a career. I have thought retirement being largely binary was lame since I figured out that is mainly how it worked. You work 40 hours a week (1,800 – 2,000 hours a year) and then dropped to 0 hours, all year long, from them on. It seems to me more gradual retirement makes a huge amount of sense (for society, individuals and our economy). That model is available to people, for example those that can work as consultants (and some others) but we would benefit from more options. Why do we have to start work at 22 (or 18 or 26 or whenever) and then work 40 or so straight years and then retire? Why not gap years (or sabbaticals)? Also why can’t we just go part time if we want. The broken health care system in the USA really causes problems with options (being so tightly tied to full time work). But I have convinced employers to let me go part-time (while working in orgs that essentially have 0 part time workers). And I am now basically on gap year(s)/sabbatical now. It can be done, but it certainly isn’t encouraged. You have to go against the flow and if you worry about being a conventional hire you may be nervous. USA health care spending continues to grow, consuming an ever increasing share of the economic production of the USA. USA health care spending is twice that of other rich countries for worse health care results. USA health care expenditures grew 3.9% to $2.7 trillion in 2011, or $8,680 per person, and accounted for 17.9% of Gross Domestic Product (GDP). Medicare spending grew 6.2% to $554.3 billion in 2011, to 21% of total health care spending. Medicaid spending grew 2.5% to $407.7 billion in 2011, or 15% of total health care spending. Private health insurance spending grew 3.8% to $896.3 billion in 2011, or 33 percent of total health care expenditures. Out of pocket spending grew 2.8% to $307.7 billion in 2011, or 11 percent of total health care spending. Hospital expenditures grew 4.3% to $850.6 billion in 2011. Physician and clinical services expenditures grew 4.3% to $541.4 billion in 2011. Prescription drug spending increased 2.9% to $263.0 billion in 2011. Per person personal health care spending for the 65 and older population was $14,797 in 2004, 5.6 times higher than spending per child ($2,650) and 3.3 times spending per working-age person ($4,511). Individuals (28%) and the federal government (28%) accounted for the largest share of those paying for health care in the USA. Businesses pay 21% of the costs of health care while state and local governments pay 17%. The United States Centers for Medicare & Medicaid Services (CMS) project that health care spending will rise to 19.6% of GDP by 2021. Since the long term failure of the USA health care system has resulted in costs increasing faster than inflation every year for decades, it seems reasonable to expect that trend to continue. The burden on the USA grows more and more harmful to the USA each year these rising costs continue. In 2004, the elderly (65 years old and older) accounted for 12% of the population, and accounted for 34% of spending. Data from US CMS (sadly the way they provide the data online my guess is this url will fail to work in a year, as they post the updated data – I don’t see a way to provide a link to a url with persistent data). Half of the population spends little or nothing on health care, while 5% of the population spends almost half of the total amount (The High Concentration of U.S. Health Care Expenditures: Research in Action).